With businesses growing larger and more demanding, the need for a global on-demand workforce has never been so urgent. Field Engineer hopes that meet that criteria by offering a globally accessible marketplace of professional engineering and IT talent. No matter what country you operate from or where you plan to expand, our network of over 40,000 skilled engineers and technicians can help your business scale to new heights. 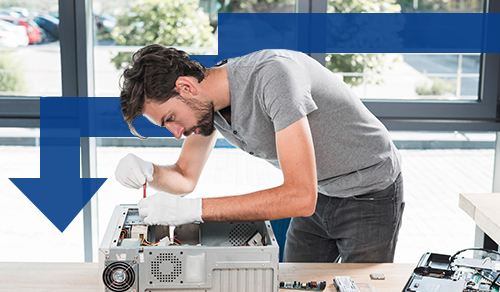 Regardless of your needs, we’ll match you with the best freelance computer hardware technician for the job. Whether you’re looking for a certified professional to help you maintain a complex system or even design and deploy a completely new computer hardware solution, you’ll find a wide variety of skill sets and backgrounds among our trusted and vetted specialists. As soon as you post a job, you’ll be met with several profiles where you can easily search for certifications, skills and experience to find the perfect candidate. No matter where you are or what device you’re using, you’ll have access to our dashboard for real-time updates so you can monitor the job progress and also contact your field engineer whenever needed. This offers you more flexibility and awareness of the ongoing project no matter how large or small it is. Simply sign up today and you’ll have access to the world’s largest marketplace of freelance engineering and IT talent.